I’m going to leave our trip and arrival the first Tuesday (June 2) out of this for now, because I want to start getting to the good stuff (the pictures, for those of you who weren’t actually there). And since we rented a car in Flushing, we actually drove around Flushing first, but let’s pretend we didn’t so we can retrace my steps in chronological order. And when I say “my steps”, I mean “my first baby steps”, because the Bronx is where I was born and grew up until high school. 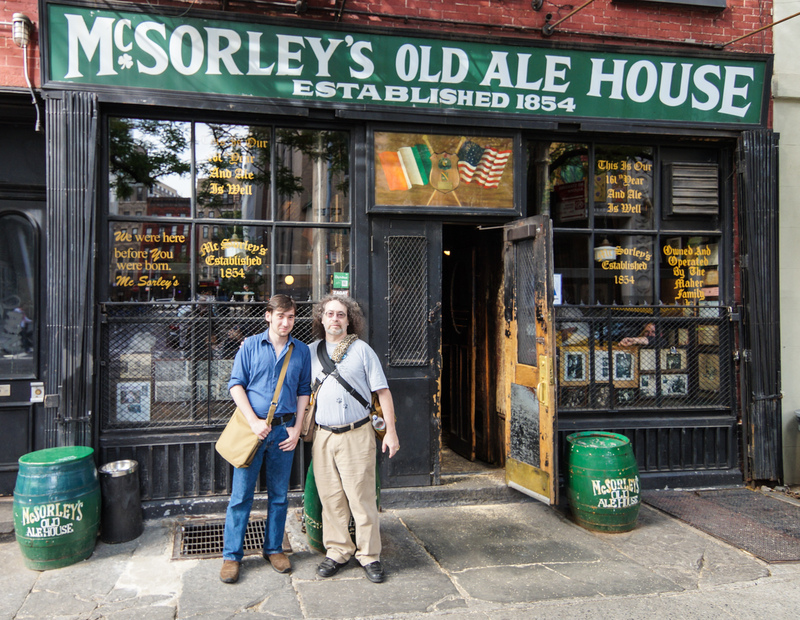 This was the premise: take my youngest son Steven all the way to New York City to drink at McSorley’s, arguably the oldest Irish bar in New York and most definitely the “house bar” of Cooper Union, where I once spent a little less than two years until I was very politely kicked out (from the school, not the bar). It does seem a bit ironically extravagant for a mostly retired guy who hardly even drinks nowadays, except that (a) Steven just turned 21 (b) he just graduated from Folsom Lake College and (c) I just got a nice affiliate commission payment from one of the websites I manage. So I actually had both a good reason and some money for once. I had a few other things I wanted to do there, mainly introduce Steven to some friends and family members he’s never met, and show him around the parts of New York that I grew up and spent a lot of time in. We had 8 days of fun, adventure, and excitement prowling the streets and subways. Now that we’re safely back, I’m trying to get all the photos processed and the blog posts written in the next week or two (we’ve both been a bit wiped out by all this). So please follow along! Note: as always, remember to click on the photo to see a larger version or go into slideshow mode.